درگاهی, عبداله, الماسی, علی, محمودی, مجتبی, خاموطیان, راضیه. (1393). کارایی برکه تثبیت اختیاری در حذف فنل از فاضلاب پالایشگاه نفت. مجله آب و فاضلاب, 25(6), 114-121. عبداله درگاهی; علی الماسی; مجتبی محمودی; راضیه خاموطیان. "کارایی برکه تثبیت اختیاری در حذف فنل از فاضلاب پالایشگاه نفت". مجله آب و فاضلاب, 25, 6, 1393, 114-121. درگاهی, عبداله, الماسی, علی, محمودی, مجتبی, خاموطیان, راضیه. (1393). 'کارایی برکه تثبیت اختیاری در حذف فنل از فاضلاب پالایشگاه نفت', مجله آب و فاضلاب, 25(6), pp. 114-121. درگاهی, عبداله, الماسی, علی, محمودی, مجتبی, خاموطیان, راضیه. کارایی برکه تثبیت اختیاری در حذف فنل از فاضلاب پالایشگاه نفت. مجله آب و فاضلاب, 1393; 25(6): 114-121. فنل یکی از هیدروکربن‌های آروماتیک سمّی است. این ماده از طریق دفع فاضلاب تعدادی از صنایع باعث آلودگی محیط زیست و به‌خصوص منابع آبی می‌شود. این مطالعه از نوع تجربی بود؛ برکه تثبیت اختیاری در مقیاس آزمایشگاهی با ظرفیت 400 لیتر و با استفاده از ورقه فایبرگلاس با ضخامت 6 میلی‌متر طراحی، ساخته و راه‌اندازی شد. زمان ماند هیدرولیکی برکه اختیاری در این مطالعه 10 روز بود. پس از راه‌اندازی و بذرپاشی و تثبیت بیولوژیکی، نمونه برداشت شد. 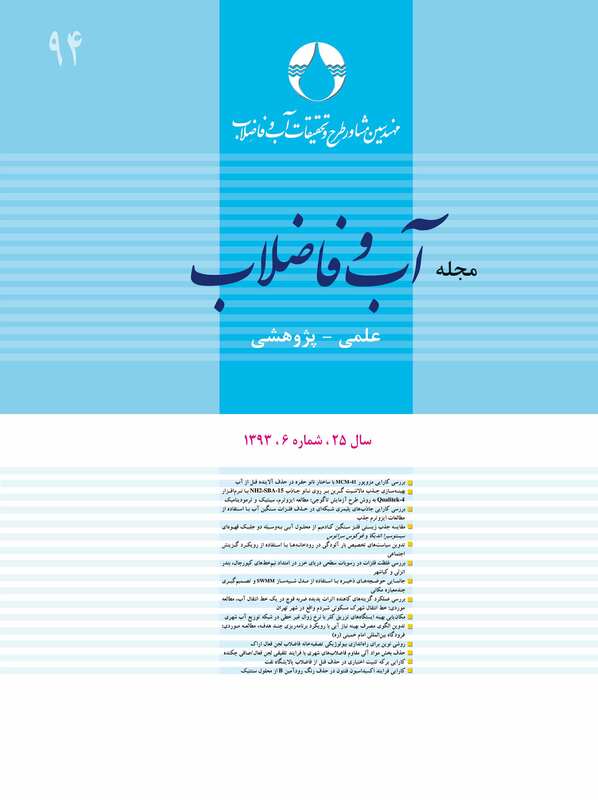 در ورودی برکه تثبیت اختیاری بر حسب میزان حذف فنل در برکه تثبیت بی‌هوازی، غلظت‌های فنل0 تا 28، 30 تا 80، 90 تا 130 و 150 تا 200 میلی‌گرم در لیتر برای دمای بالا و غلظت‌های فنل 100 تا 140 و 200 تا 260 میلی‌گرم در لیتر برای دمای پایین در نظر گرفته شد. سپس پارامترهای NH3، PO4، فنل به‌ترتیب در طول موج 425، 690 و 500 نانومتر توسط دستگاه اسپکتروفتومتر واریان مدل UV-120-02 برای هریک از نمونه‌ها و همچنین TCOD،SCOD ، TBOD، SBOD و pH آنها اندازه‌گیری شد. نتایج نشان داد که دما و غلظت فنل تأثیر چشمگیری بر کارایی برکه اختیاری دارند. همچنین کارایی برکه اختیاری با کاهش غلظت فنل و افزایش دما، افزایش پیدا می‌کند (001/0>p). بیشترین و کمترین راندمان حذف فنل توسط این سیستم به‌ترتیب برای غلظت 0 تا 28 میلی‌گرم در لیتر در دمای بالا، 8/71 درصد و 200 تا 260 میلی‌گرم در لیتر در دمای پایین، 66/14 درصد به‌دست آمد. نتیجه بررسی نشان داد که برکه تثبیت اختیاری در مقیاس پایلوت، در صورت راهبری مناسب، قابلیت حذف ترکیبات آلی همراه با غلظت‌های مختلف فنل در دمای بالا را با کارایی زیاد داراست. Phenol is a highly toxic aromatic compound discharged into the environment through industrial effluents. The natural biological treatment process has been widely used as one of the most feasible, eco-friendly, and cost-effective options for the treatment of pollutants such as phenol. The objective of the present experimental-analytical study was to evaluate the performance of the facultative stabilization pond in removing phenol and other organic compounds from oil refinery effluents. For the purposes of this study, a pilot-scale anaerobic stabilization pond 1.2×0.6×0.55 m in size was constructed of fiberglass sheets 6 mm in thickness. The experiment was run with a hydraulic retention time of 10 days and a hydraulic loading rate of 43.5 l/d. The organic loading rate for the facultative pond was 150 kg/h.day. Samples were taken after pond operation and seeding when the pond reached its biological stability. Depending on phenol removal levels in the anaerobic stabilization pond, initial phenol concentrations at the inlet to the facultative pond were assumed to be 0-28, 30-80, 90-130, and 150-200 under warm conditions and 100-140, and 200b-260 mg/l in cool conditions. For each sample, the parameters NH3, PO4, and Phenol were measured using the Varian spectrophotometer (model UV-120-02) at the wavelengths of 425, 690, 500 nm, respectively. TCOD, SCOD, TBOD, SBOD, pH, and ORP were also measured according to the standard methods of water and wastewater. The results showed that phenol removal efficiency of the facultative pond was 71.8% for warm temperatures and 14.66% for cool temperatures. It was also found that temperature and phenol concentration significantly affected the performance of the pond. Moreover, its performance was observed to enhance with reducing phenol concentration and increasing temperature (p<0.001). Maximum phenol removal efficiency of the system was recorded at 71.8% for warm temperatures and a low phenol concentration of 0–28 mg/l while its minimum of 14.66% was recorded at a high phenol concentration of 200-260 mg/l under cold weather conditions. Based on the results obtained, it may be concluded that the pilot-scale facultative pond has a high performance in removing organic compounds with different concentrations of phenol under warm weather conditions. 1. Yapar, S., Ozbudak, V., Dias, A., and Lopes, A. (2005). “Effect of adsorbent concentration to the adsorption of phenol on hexadecyl trimethyl ammonium-bentonite.” J. Hazard Mater, 100(1-3), 135-139. 2. Bayramoglu, G., and Arica, M.Y. (2008). “Enzymatic removal of phenol and p-chlorophenol in enzyme reactor: Horseradish peroxidase immobilized on magnetice beads.” J. Hazard. Mater., 164(2-3), 148-155. 3. Busca, G., Berardinelli, S., Resini, C., and Arrighi, L. (2008). “Technologies for the removal of phenol from fluid streams: A short review of recent developments. J. of Hazardous Materials., 160, 265-288. 4. Idris, A., and Saed K. (2002). “Degradation of phenol in wastewater using anolyte produced from electrochemical generation of brine solution.” Global NEST: The International Journal, 4 (2-3), 139-144. 5. Pimentel, M., Oturan, N., Dezotti, M., and Oturan, M.A. (2008). “Phenol degradation by advanced electrochemical oxidation process electro-fenton using a carbon felt cathode.” Applied Catalysis B:Environmental, 83, 140-149. 6. Patterson, J. W. (1975). Wastewater treatment technology, Ann Arbor Science Publishers Inc., USA. 7. Ersoz, D., Adil, S., Izzet, A., Ayca, D., and Sibel, S.R. (2004). “Removal of phenlic compounds with nitrophenol- imprinted polymer based on and hydrogen-bonding interactions.” Separation and Purification Technology, 38 (2), 173-179. 8. Kinsley, C., and Nicell, J. A. (2000). Treatment of aqueous phenol with soybean peroxidase in the presence of polyethylene glycol.” J. of Bioresource Technol, 73, 139-146. 9. Dyer, J. C., and Mignone, N. A. (1993). Handbook of industrial residues, Vol. 1, Environmental engineering series, Noyes Publications, Park Ridge, NJ, USA. 10. Kehma, H., and Reed, G. (1999). Biotechnology, 2nd Ed., Vol, 11a. WIEY- VCH, Weinhem, Germany. 11. Tchobanoglous, G., Burton, F.L., and Stensel, H.D. (2003). Wastewater engineering treatment and reuse, 4th Ed., Metcalf and Eddy, McGraw-Hill, Inc., USA. 14. Mozaheb, S. A., Fallahzadeh, M., Ghaneian, M. T., and Rahmani Shamsi, J. (2009). “Effect of organic load, pH and EC variations of raw wastewater and weather condition on the efficiency of Yazd stabilization ponds.” J. of Water and Wastewater, 70, 55-61. (In Persian). 15. Benefield, L. D. (1980). Biological process design for wastewater treatment, Englewood cliffs: Prentie- Hall. 16. Beran, B., and Kargi, F. (2005). “A dynamic mathematical model for wastewater stabilization ponds.” Ecological Modeling Journal, 181, 39-57. 17. World Bank Group. (1998). Pollution prevention and abatement: Petroleum refining, Draft Technical Background Document, Environment Department, Washington, D.C.
19. APHA. AWWA. WEF. (1998). Standard methods for the examination of water and wastewater, 20th Ed., Washington D.C.
20. Avelar, F.J., Martınez-Pereda, P., Thalasso, F., Rodrıguez-Vazquez R., and Esparza-Garcıa, F.J. (2001). “Upgrading of facultative waste stabilisation ponds under high organic load.” Biotechnol. Lett., 23, 1115-1118. 21. Meneses, C.G., Saraiva, L.B, Melo, H.N., de Melo, J.L., and Pearson, H.W. (2005). “Variations in BOD, algal biomass and organic matter biodegradation constants in a wind-mixed tropical facultative waste stabilization pond.” Water Sci. Technol., 51(12), 183-190. 22. Oswald W. J., Golueke, C. G., and Tyler, R. W. (1967). “Integrated pond systems for subdivisions.” In: J. WPCF, 39 (8), 1289. 23. Oliveira, R. D. (1990). “The performance of deep waste stabilization ponds in Northeast Brazil.” PhD. Thesis, University of Leeds, UK. 24. Arceivala, S. J. (1973). “Simple waste treatment methods: Aerated lagoons, oxidation ditches, stabilization ponds in Warm and temperate Climates.” Middle East Technical University, Ankara. 25. Almasi, A. (1994). “Wastewater treatment mechanisms in anoxic stabilization ponds.” PhD. Thesis, University of Newcastle Upon Tyne, UK. 26. Almasi, A., and Pescod, M.B. (1996). “Wastewater treatment mechanisms in anoxic stabilization ponds.” Wat. Sci. Tech., 33(7), 125-132. 27. Gabriel, B. (2005). Wastewater microbiology, 3rd Ed., John Wiley and Sons, Inc., New York. 28. Mosavi, Gh., Mahmoudi, M., and Barikbin, B. (2009). Biological removal of phenol from strong wastewaters using a novel MSBR.” J. of Water Research, 43 (5), 1295-1302.